The GVSD Help Desk is a service of the Information Technology for Learning department. We provide IT support for all employee groups via our Web Help Desk Ticket system. Anyone with an SD61 email address can request assistance using this resource. If you have an urgent request, or difficulties in accessing your account, please contact Help Desk directly at (250) 475-4188, or helpdesk@sd61.bc.ca. Although we are always happy to assist, some of the most frequently encountered issues by staff in our district can be managed without having to contact Help Desk. Please refer to the advice below to see if your problem can be resolved without having to submit a ticket. All computers benefit from a weekly restart. Windows 10 computers in particular receive regular updates which require restart. A restart can also resolve many computer issues without need of further intervention. Depending on the brand, pushing the power button may only put the computer to sleep. 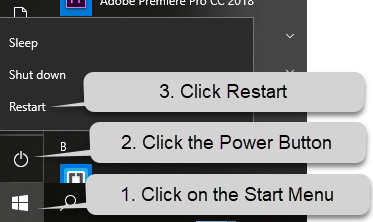 Therefore, to ensure that you are doing a full restart/shutdown use the Start Menu as illustrated in this GIF Animation. You can also enlarge the image on the right by clicking on it. 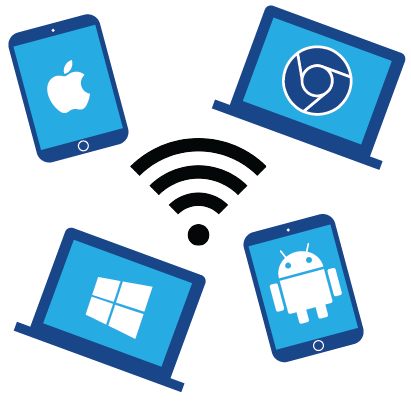 The SD61 Wireless Network is available to all employees and students within the district (although elementary students may need to request access). Instructions for connecting vary by device. This resource provides information for the most common devices in use. District Email is available through the Outlook Web App (OWA) from any web browser by following this link. All district supplied desktop and laptop computers can also access email with the Outlook desktop application. Open the email application on your device (name and location of the app vary by device), and/or enter your account information in the device’s settings. Choose Exchange/Office 365 as the account type. Provide your district email information (username@sd61.bc.ca) followed by your password. MyFiles is a service that provides secure access to documents stored on the SD61 server from any personal computer, using a web browser (ex. Google Chrome). It is available to all staff. Staff can download files on their home drives (H:) as well as any collaborative folders staff belong to (ex. W: Drive). More information about the service is located here. Instructions on how to use the service are available here. A video tutorial can be found here. This page includes links to Quick Start Guides and video tutorials for individual Office programs, as well as links to additional detailed Microsoft training materials.